Enamoured with Marie-Therese Walter, Picasso embarked on a prolific series featuring her face and profile, which progressively became more lyrical and harmonious. It marked a return to recognised signifiers of beauty as voluptuous curves and sensations of feminine sensuality began to fill the canvas once more. The resulting lack of vulgarity is replaced by a mood of dreamy trances and self-contemplation, whether reading a book, as in this case, studying one's reflection, or resting as in Asleep (1932). Prototype woman now begins to be recreated into a new and much more substantial form and, like Picasso's teenager lover, embarks on an adolescent voyage of sexual and psychological awareness. The significant development of this phase is the formalised experiment with colour, and choice of pigment and application, like Henri Matisse. A new-found vigour bursts as colour onto the canvas as Picasso plays with Matisse's dynamic polarisation of red and green and the inclusion of patterning. 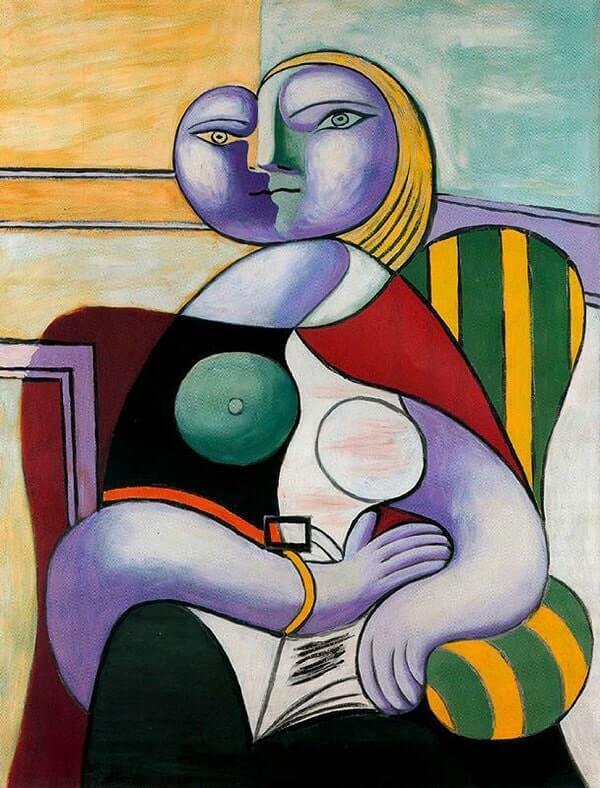 The significantly heart-shape faced woman is an evolution of Synthetic Cubist productions. The closeness of her interlacing segments of colour flattens the spatial depth, despite the artist's attempt at making the picture appear three-dimensional by painting in a corner. The intensity and contrast of the wide vertical green and yellow stripes provide a tonal armature to hold the flowing lines of the female shape in place.